Though I'm Pinoy through and through because I prefer rice, it's not the same when it comes for breakfast. I'm more of the pan de sal gal and more so if it's pancakes or waffles. Not the one with chips or berries. I like mine hot, steamy, fluffy and buttermilk! The oozing maple syrup and the creamy butter melting from the fresh off the pan pancakes. I'm craving for one right now! Thank God that tomorrow is Ihop's National Pancake Day and our favorite Buttermilk Pancakes are unlimited the whole day for only P250! How freaking awesome is that? 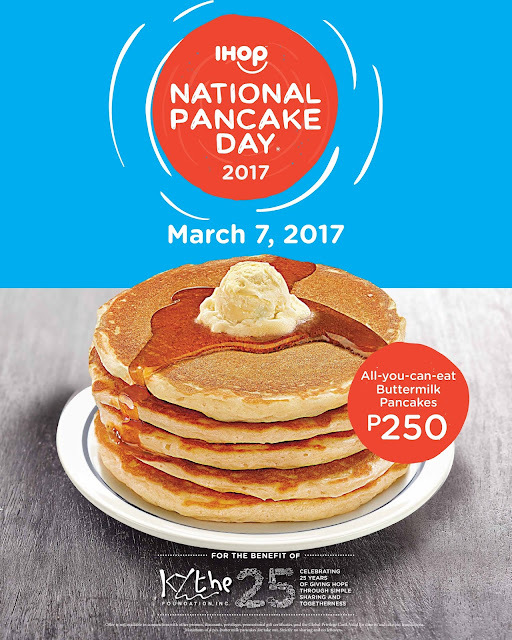 ALL-YOU-CAN-EAT for PHP250.00 from 7 AM to 10 PM on March 7, 2017 (Tuesday). This is not a drill, love. It's happening and it's happening with a confidently beautiful with a heart because Ihop is in partnership with Kythe Foundation because P200 out of the P250 for will be donated to said them. Kythe has been around the Philippines for years and they continiously provide children with cancer and chronic illnesses the chance to learn, play and gown while in treatment. I met with some of these children and they have exceptional stories to tell because you could barely see the trace of cancer in their smiles. These children then, now adults, are now part of Kythe Foundation. Charm, 22 year old, was diagonised with Bone cancer. He share with us how reluctant he was to the help f his teachers in Kythe but his teacher didn't stop from trying to gain his friendship and confidence. Soon he was back to old disposition was and was able to deal with his sickness through Kythe's help. Carmina, 22 years old, was diagnosed with Leukemia when she was 15 years old. Going through that and growing up put a toll on herself and her body and so she sought out Kythe Foundation. There she learned to interact again and meld the life she had back then and still grow up normally. She lost her hair at some point but with Kythe's help she dealt with it well and soon recovered. Now that I'm a mom, I can say that play, interaction and making things fun is a way to help my child learn and cope with her anxiety. Children have to taught how to communicate and so I totally in agreement with Kythe on this regard. I can't imagine the stress, the pain and the confusion a child is going through when he or she is told he/she has a cancer. If raising a child takes a village, it takes the whole world to help a child with sickness. The people behind Kythe continues to seek help, talk to government officials, departments to institutionalize social activities in pediatric patients. They have actually done a study that will soon be published that shows how Psychosocialsocial Support through arts and crafts and the likes helps with recovering patients of cancers and chronic illnesses. A Child Life Program needs to be set in place in our country. Now I don't want to put a damper on your day. But I hope I made you aware how good it will be for you to take advantage of eating the best buttermilk Pancake in unlimited proportion! Carmina is now works for Kythe! And just to let you know, fellow rice lovers, there is a new menu of rice breakfast meals at iHop. You'll love the Porkshops and Adobo! Wow! 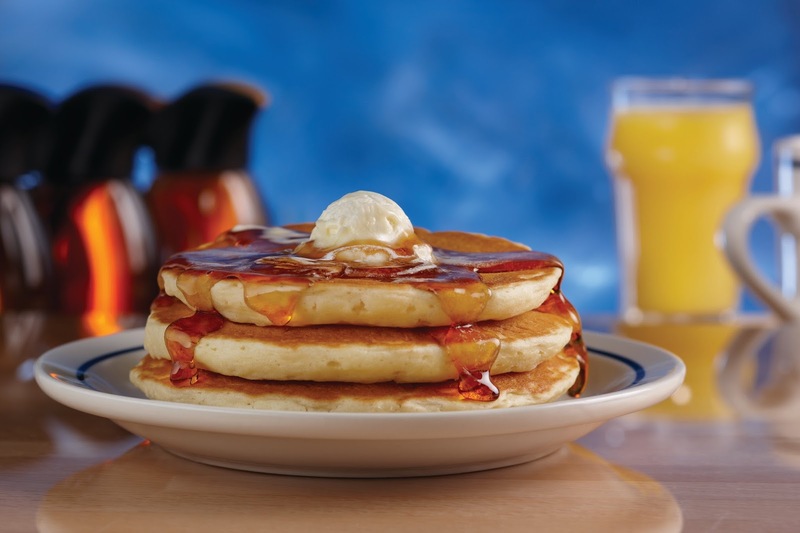 I missed this one :) I love IHOP pancakes!